IN the last Book of the Old Testament is an amazing PROPHECY. It foretells cause of a national calamity soon to happen to the UNITED STATES! It is a WARNING for America and Britain, now! It it not dead history, not abolished teaching for Jews of a bygone day. It is a live, timely PROPHECY. "I will come near to you to judgment.... Even from the days of your fathers ye are gone away from mine ordinances, and have not kept them.... YE ARE CURSED WITH A CURSE: for ye have robbed me, even this whole nation." (Mal 3:5-9). But why? What has brought on this national curse, soon to bring upon this nation a calamity of the most cataclysmic ever to befall any nation in history — as prophesied in many other prophecies — prophecies which have repeatedly been explained in the many previous articles in this magazine. Now all this, we know, doesn't make much sense to the average American today. Many do not even know what tithing is. Others ask, "Wasn't tithing just for Jews of a long-dead past?" Or, Wasn't tithing done away? Wasn't it just part of the ceremonial system introduced by the Old Covenant Law of Moses?" Since this WHOLE NATION is under a curse, soon to suffer unprecedented total national disaster because of a lack of understanding as well as disobedience to the laws of God, it's certainly about time we opened our Bibles and began to study honestly, diligently, prayerfully, exactly what the Almighty has declared on this much-perverted subject! For — and mark this well! — even though God sends a cataclysmic destruction upon the nation as a whole, yet the individual who seeks understanding, and who heeds God's warnings, shall be given full protection, and ESCAPE all these things to come to pass. God says to Britain-America of today: "Ye art cursed with a curse: for ye have robbed me, even this whole nation... IN TITHES and offerings." What, then, does God mean by that word "tithes"? It is an old English word, commonly used in England three and four hundred years ago. Today it is seldom used, except in this scriptural connection. This old expression "tithe has been preserved in the Authorized, or King James translation, of the Bible — translated in 1611. It is well known that the nation Israel, during Old Testament times, was required to tithe, that is, pay in one tenth of income. But the matter of to whom each Israelite paid his tenth, which tenth was paid, why and for what purpose, seems to confuse a great many today. And the New Testament teaching for Christians about tithing is understood only by a few. The subject is mentioned many places in the New Testament, as well as in the Old. But first, a simple explanation of the scriptural PRINCIPLE of tithing will make it more understandable. Let's bring the subject home to each one of us, in a plain and personal manner. Suppose you own a farm. Does that farm, and all you raise from it, really belong to you? Suppose you work for wages, or a salary. Or you "clip coupons," or receive dividends, profits, or a pension. When you receive the money, is it really YOURS? This may seem a bit foolish. Nearly everyone will answer immediately, "Why, of course!" But if you do, you're wrong! And this only goes to show that our people as a nation have strayed so far from God and His revealed TRUTH that we are astonished, when the truth is explained! Do you know what the Bible is? It is a revelation from God to man of things both material and spiritual which man otherwise could never know. God let Newton discover and reveal to mankind the law of gravity. He has left it for our chemists with their test-rubes and technical equipment in their laboratories to discover the laws of chemistry. But there are laws and truths which man never could discover. God has not left us in ignorance of these, but has revealed them, in His Bible! That's why the BIBLE is the very BASIS of right and sound education — "the fear of the Eternal is the beginning of wisdom." And that's why there is so little real understanding and TRUE education today, in a world whose schools and colleges almost universally ignore this basic foundation of TRUTH! Who OWNS What You Have? So now in the simplest of language, let me make plain to you the PRINCIPLE of tithing, as revealed in the Bible. Then we shall look to the Scriptures themselves, from which this explanation is derived. First, then, YOU, or I, actually own nothing! "The earth is the Eternal's, and the fullness thereof; the world, and they that dwell therein." (I Cor. 10:26, and Psa. 24:1.) In Job 41:11, God the Creator says: "whatsoever is under the whole heaven is mine." God Almighty is CREATOR. He created the earth. He created man upon the earth. ALL BELONGS TO HIM! It is, therefore, for HIM to say how much of what you earn you may keep and use for yourself. Your farm actually does not belong to you — GOD is the true owner. Your income is not really yours — because ALL belongs to GOD! Now in the BIBLE, God reveals to man that He never has given to man the whole of what he produces or earns. The FIRST TENTH of all you produce from the ground — of your wages, your salary, your profits, your INCOME — that FIRST TENTH remains HOLY to the Eternal, and that He has reserved for Himself — for His holy and spiritual use! After man has PAID TO GOD that first tenth which belongs only to Him — and which never belonged to the man, — then the remaining nine-tenths God gives to the man. It's a good deal like Adam and Eve in the Garden of Eden — and the first sin. The garden was beautiful beyond description. Just one tree, however, God reserved for Himself. That, remained HIS. That, He never gave to Adam and Eve. That, they had no right to touch, or use. All the rest He gave to them. But they were not satisfied with what was theirs, ample tho it was. Filled with greed to possess all, they reached out and took the fruit of that forbidden tree! And that was stealing! It was coveting! It was placing another god before the CREATOR! It was dishonoring their Creator-Father! It broke FOUR of the Ten Commandments! It was SIN — the original sin! And today, the same Satan who deceived mother Eve has deceived this whole world into believing that all of each man's farm belongs to him — that the whole of a man's income is his! This divine and original TRUTH of ownership has been hidden from the people thru the deceptions of the god of this world! And today, nearly every American is taking and spending that first tenth of his income which BELONGS TO ALMIGHTY GOD! Actually, in so doing, the individual and this whole nation is ROBBING GOD, just as surely as Adam and Eve robbed GOD when they stole the fruit of the one tree which never belonged to them! But WHY does God retain for Himself the ownership of that first tenth — the TITHE — of your income? Here again comes a TRUTH man would never know, and could not find out, except by God's revelation to man! What is man, anyway? WHY is he? Where is he going? GOD HAS A PLAN! God is working out a GREAT PURPOSE! He reveals it in His Word — His revelation — the BIBLE. During the national dispensation of Israel, under the Old Covenant, known as the Mosaic dispensation — those years from Moses until Christ — the tribe of Levi constituted the ministry of God, known as the Levitical priesthood. Then later, when Jesus Christ arose from the dead, He ascended to heaven as a living HIGH PRIEST. Today He calls ministers as His true representatives in a darkened and Satan-deceived world, to carry on HIS PLAN. Today the Melchizedec Priesthood is restored, in Christ. Now it costs money to carry on the work of God. God's ministers who devote their entire time to God's holy and spiritual purpose are prevented from earning a living in the usual channels. Yet they work. If they are true ministers, they are men of ability who WORK HARD, and long, observing no hours. Actually they earn a living — they have worked for their food, shelter and clothing and physical needs — the same as the farmer, the laborer, the clerk or the merchant. In God's great Plan, HE pays His ministers. It is HE who "hires' them — He who calls them to their work for Him. But how can you pay God's tenth to Him? God is on His throne in heaven. And "no man," said Jesus, "has ascended to heaven." You can't go there. You can't see God, or hand your money to Him personally. How, then, can you pay Him HIS TITHE? Well, some large corporations, perhaps in a distant city, cannot be directly contacted by their many customers. And so they send around representatives, collectors, to collect for them what you owe the company. The collector comes in the name of the company. When you pay the money which really belongs to the company, to the collector, you have paid the company. And when you pay such a bill to a collector, you consider you paid THE COMPANY — not that you made a personal donation of your own money to the man the company sent You paid it as TO THE COMPANY. From there on it is the COMPANY'S responsibility what happens to that money, not yours. And the company pays the collector his salary. He does not consider that you paid his salary — he receives his salary as from the company. This illustrates plainly God's true principle of tithing. When you pay tithes today you are instructed by God's directions to pay them to God's called and chosen representative — the true minister of Jesus Christ But you pay it, not as a personal contribution of your own money to a minister — but AS TO GOD. The minister represents GOD — receives not your money but GOD'S money from you for God. Here again so many in this modern world have lost sight of God's clear directions. When they give the tithe to a minister they seem to feel it is a special entrusting of their own money, and they make it their duty to try to supervise how the minister handles it — even, in some cases today, down to the supervision of what the minister and his family may eat, or wear, or have in their personal private family life! But God's revealed principle is quite different. That first tenth of your income is not yours — never was yours! It belongs to God. And the method God himself instituted for your payment of His money to Him is to pay it to His called and true ministers. When you have done that, your responsibility for that money ceases! You have no further concern, responsibility, or direction in the handling of it than you have in money you owe the electric light or the telephone company which you pay to their collector. Once paid, you have DONE YOUR PART — you have acquitted yourself of your obligation. Of course you are expected to be sure the collector is the company's approved representative — not a thieving imposter pretending to be the company collector. And you should be equally sure you are paying your tithe to a called and TRUE minister of Jesus Christ. Satan has many more ministers today than Christ — and Satan's thieving imposters pose as ministers of Jesus Christ, put on sanctimonious airs, speak in pious and spiritual-sounding language! How are you to know? BY THEIR FRUITS, Jesus said, you shall know them! The FRUITS of God's Spirit, and of Christ's true ministry cannot be counterfeited! So when you pay tithes to God's true and accredited spiritual representative, you pay it as to God. It is not a charitable gift from you to the minister. It is not your money — but rather it is God's way for you to pay to GOD, that which BELONGS TO GOD. And from there on, the minister who receives it is accountable to God. And you may be sure that GOD'S justice is PERFECT — that GOD Almighty will hold every minister far more strictly accountable than you would be capable of doing! And the answer, which we will show by the Scriptures inspired of God, is that God uses it FOR HIS MINISTRY — for CARRYING ON HIS WORK! Now the nature of God's ministry on earth has changed with changing dispensations. Not much is revealed as to how God's ministry was carried on back in patriarchal times. We know Melchizedec was High Priest — that He held rank equal to that of Jesus Christ, actually one of the Godhead! The ministry, then, must have been of a spiritual nature. New Testament writings reveal that the GOSPEL, God's Spiritual Message, was preached beforehand to Abraham. All we know of those days of the dim distant antiquity is that the tithes were paid to Melchisedec, a divine Being, for the service of God's ministry for that time. As a Church, or Congregation, Israel was given a constant round of physical ceremonies and rituals — animal sacrifices, meat and drink offerings, carnal ordinances (see Heb. 9:10) — which, NOTE IT means of a material, not a spiritual nature. Israel under the Old Covenant was not given God's Holy Spirit. They had no promise whatsoever of salvation, astonishing as that may seem! They were not commanded to go into all the world and proclaim the Gospel to other nations. On the contrary, they were forbidden to have anything to do with other nations! Consequently, the church ministry in Israel was one of ministering to all Israelites, and to Israelites only. There was no spreading of the Gospel. The ministry, rather, was largely a matter of physical labor — preparing animal sacrifices, meat and drink offerings, administering the different washings and physical ordinances and rituals. For this service, God Himself selected His ministers — the people had no choice as to who their ministers were. For this service, God took ONE WHOLE TRIBE of the twelve tribes of Israel — the Tribe of Levi. Every man born a Levite was a priest, or minister. The Levites owned no land — had no secular source of income — devoted their entire time to the physical ministry of that dispensation. Yet, tho a physical ministry, this service was sacred and holy to God. And during these years from Moses to Christ God Himself paid His Levitical priests by turning over to them all of His tithe. Today, we are in the age of GRACE — the NEW Testament GOSPEL dispensation. Today, the Levitical priesthood is gone, and JESUS CHRIST is High Priest. Today all true ministers of Jesus Christ are called by special spiritual call from God thru His Holy Spirit — not by flesh birth — not by self desire to become a minister — not by selection, appointment, or vote of the people. Jesus Christ came as God's MESSENGER, bearing a Spiritual Message from God to man. That Message of His GOSPEL — the Good News of the coming KINGDOM OF GOD, a kingdom of immortals which human flesh and blood can never enter! One must be born again! And today, Christ's commission to all His true ministers is "Go ye into all the world, and PREACH THE GOSPEL"... "Go ye, therefore, and teach ALL NATIONS." And, for our day now. "This GOSPEL OF THE KINGDOM shall be preached in all the world for a witness unto all nations; and then shall the END (of the age) come." Today the ministry is a SPIRITUAL ministry — a ministry of PROPHECY — a ministry of SALVATION — a ministry of WARNING! Today it is not physical and national, but spiritual and individual and is not for everyone in a single nation, but for a witness UNTO ALL NATIONS. Today, in these critical, chaotic days approaching the END OF AN AGE, the carrying on of God's true ministry is a world-wide mission, which must reach MILLIONS of people, and quickly, for the "night cometh, when no man can work." Today Christ's true ministry is a huge undertaking. It requires, not the mere financing of the personal needs of a few ministers, but the employing of tremendous available facilities for PROCLAIMING THE WORLD-SHAKING WARNING — for PREACHING THE GOSPEL OF THE KINGDOM into ALL THE WORLD FOR A WITNESS UNTO ALL NATIONS! And these super-powered facilities God has invented and made available for HIS PURPOSE — great, powerful radio stations, and the modern printing press — cost a great deal of money, because they reach vast multitudes of people never before possible in any past age! Today, God has PROVIDED for the financing of His powerful ministry by the same system He has used from the very beginning — His TITHING system! Thus Almighty God has purposed that THOSE WHOM HE HAS SPECIALLY FITTED AND CALLED for this tremendous mission in this chaotic and dying world may be FREE to proclaim HIS TRUTH fearlessly, boldly, and with GREAT POWER! They cannot be subsidized, controlled, coerced by men or organizations of men. They are not hired by, nor obligated to, men or any organized group or denomination. They are called by God, guided, protected, and empowered by God, financed by GOD'S OWN TITHING SYSTEM! — yes, by GOD'S OWN MONEY! 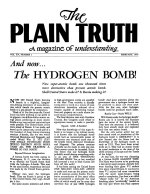 That is how THE PLAIN TRUTH is published — without subscription price, FREE to all who will request it for themselves. That is how the true GOSPEL Message is going out in great power to a cumulative audience of SEVEN MILLION EVERY WEEK, broadcast nightly at the most listened-to hour — 8 PM — over the most powerful radio station in all the North American continent. That is God's way, carrying out God's Plan in HIS GREAT PURPOSE BEING WORKED OUT HERE BELOW! And the Almighty has so guided and directed this great work of His today, that every single dollar of His money placed faithfully in His work is actually reaching TWO THOUSAND precious souls with HIS MESSAGE! Yes, it is growing into a huge work. It costs today a great deal of money. But it is reaching MILLIONS of people with power — and at the infinitesimal cost of only one dollar for each two thousand reached! We — and all our co-workers together — are happy to be privileged by the Eternal God to each have our small part in so glorious a work for HIM!